One of the key rules of yacht design is that nothing is impossible, as our round-up of the best gardens on board superyachts proves. This vast tropical superyacht garden, comprising real grass and plants, makes you forget you’re sailing across the ocean on a 76.61 metre Amels. An ideal spot for enjoying afternoon tea, this area was created at the request of Boadicea's owners as many of their guests wanted to bring their dogs on board. 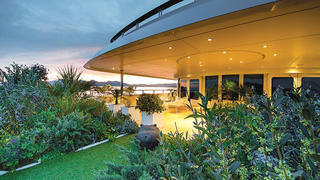 One of the key rules of yacht design is that nothing is impossible, as our round-up of the best gardens on board superyachts proves. This vast tropical superyacht garden, comprising real grass and plants, makes you forget you’re sailing across the ocean on a 76.61 metre Amels. An ideal spot for enjoying afternoon tea, this area was created at the request of Boadicea's owners as many of their guests wanted to bring their dogs on board. 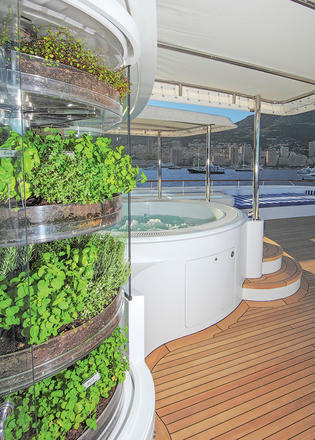 The 73.2 metre Laurel features a temperature-controlled garden that provides fresh herbs and spices next to the superyacht spa pool on the sundeck — perfect for enjoying a mojito at sea. 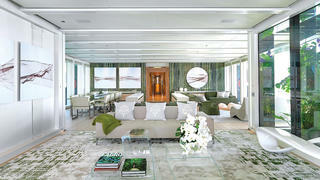 Launched by Seattle-based yard Delta Marine in 2006, Laurel is one of the largest superyachts built in the USA to date. Living up to her idyllic name, the 54.9 metre Benetti superyacht Ocean Paradise has a calming Zen garden with bonsai trees in the main deck foyer to inspire a feeling of relaxation. Designer Mauro Izzo describes this area as “an element that expresses naturalness and vitality together” and the crew proudly tends to it on a daily basis. 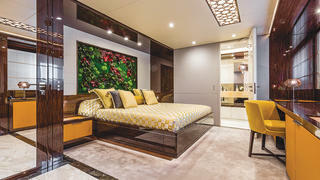 A “dream” garden of real greenery — its sap replaced by a chemical mixture — hangs over the beds in the guest cabins on board this 42.4 metre Mondomarine. 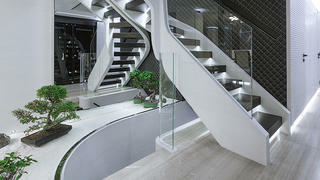 This unique feature was one of the key reasons why Serenity was nominated for both the 2016 ShowBoats Design Awards and the 2016 World Superyacht Awards. A glass-enclosed vertical garden rising from the main deck to the level above makes 72.2 metre VSY Stella Maris a vision in green. Designer Espen Øino told Boat International that he wanted to “hit the perfect balance between form and function, innovation and technology, comfort and aesthetics”. From an engineering point of view, vibration reduction was particularly important, as this area sits directly above the engine room. A glass-enclosed vertical garden rising from the main deck to the level above makes 72.2 metre VSYStella Maris a vision in green. Designer Espen Øino told Boat International that he wanted to “hit the perfect balance between form and function, innovation and technology, comfort and aesthetics”. From an engineering point of view, vibration reduction was particularly important, as this area sits directly above the engine room. Her colourful exterior is not the only thing that makes Sea Owl a green superyacht. 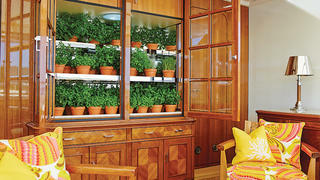 To spice up meals on board, the chef can pick fresh herbs from the nifty garden on the superyacht sundeck of this 61.9 metre Feadship. Launched in 2013 by the venerable Dutch yard, Sea Owl features interior and exterior styling by British studio Winch Design.